Trailer Suspension Nuts & Bolts – RV Blues on Rough Roads! Lots of full-time RVers with big rigs are very sensible and stick to traveling on paved roads. But we like to get off the beaten path, and sometimes that puts us on crazy, rough and rugged dirt roads. 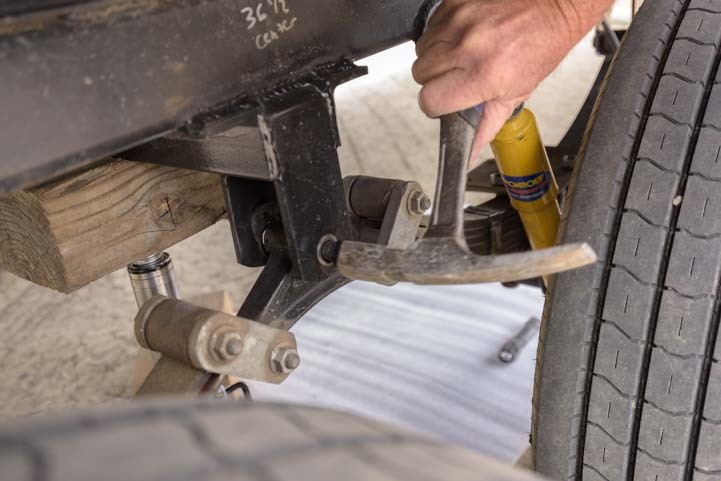 On our recent trip to Bisti Badlands in northwestern New Mexico, a 45 minute drive down three miles of extremely washboarded, nasty dirt road wreaked havoc with our trailer’s suspension. Hmmm…. That center bolt on the equalizer doesn’t look right! As we were hitching up to leave, Mark did his usual walk around our trailer to make sure nothing was about to fall off and that everything was secure. 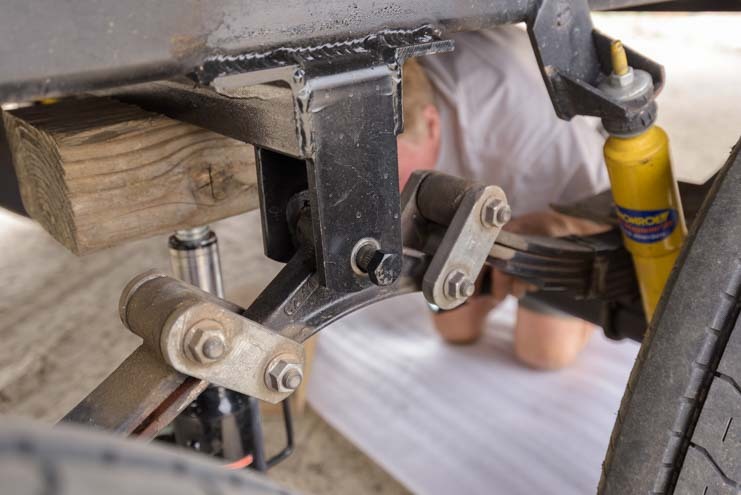 To his shock, he noticed that the long bolt that goes through the equalizer on our trailer’s leaf spring suspension system had walked almost all the way out! Holy Smokes! Our 14,000 lb. 36′ fifth wheel trailer was about to lose the bolt holding this vital piece of gear together! We were miles from nowhere, and I immediately began scenario building in my head to plan various ways we might get out of this mess. While I theorized, Mark calmly set about getting out his tools and tackling the problem right there in the dirt. His first task was to raise the trailer up so he could get the bolt properly aligned horizontally and tap it back into place with a hammer. So, out came the 12 ton bottle jack. Raise the wheels totally off the ground with our 12 ton bottle jack. 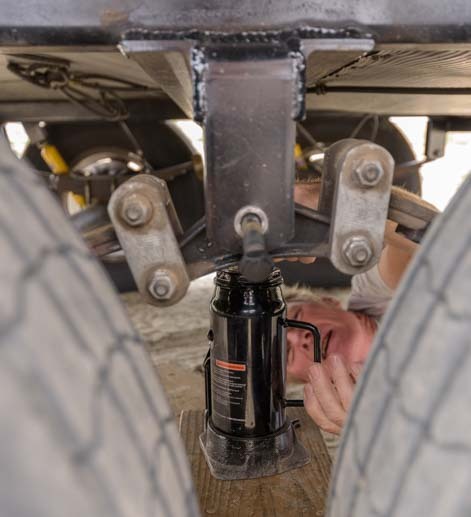 He needed to raise the trailer up quite high to relieve all the pressure on that bolt, so he took a piece of wood we sometimes use under the fifth wheel landing legs and put it under the bottle jack to raise it higher. Then he took a second block of wood and put it on top of the bottle jack to span the c-channel tube that runs the width of the trailer. Pumping away on the bottle jack, he finally got the wheels entirely off the ground and began tapping the bolt through the two sides of the hanger with a small hammer. With the pressure off, Mark taps the bolt back into place. It took a little finagling to get the bolt to line up and go through the second hole on the back side of the hanger. At first, the bolt didn’t want to go through the second hole on the axle hanger. But he was able to get it aligned and he got it to go through. All the way through. Yay! The bigger problem, though, was figuring out what had happened to the nut that had been holding this bolt in place. It was nowhere to be found and undoubtedly was somewhere out on that nasty 3 mile dirt road. Mark is a really amazing mechanic, and he keeps a magic container of potential spare parts in his Man Cave in the basement of our trailer. This magical container is a lot like the carpet bag that Mary Poppins carried. Remember how Mary Poppins pulled all kinds of surprising things out of that bag, to the sheer delight and amazement of Jane and Michael Banks? Among other things, she pulled out a hat rack, a potted plant and a full-size standing lamp while Michael searched under the table to try to figure how she did it. Well, that’s just the way Mark’s magic box of spare parts tricks works. When he needs a special little gizmo to make things right again, he fishes around in the box and finds just the thing while I scratch my head wondering how such a little container could always produce exactly what he needs. A few months back we’d replaced the tires on our fifth wheel trailer and decided to replace the original lug nuts with locking lug nuts. A few of the original lug nuts also had cosmetic cracks on them which didn’t look attractive, so the new locking lug nuts were much nicer all around. Mark had decided to put a few of the old lug nuts in his magic box of tricks. A few months back we had replaced all the lug nuts on our trailer wheels. So, as he fished around for an appropriately sized nut, lo and behold, it turned out those lug nuts were the exact diameter he needed! This old lug nut is exactly the right diameter for our wayward bolt! 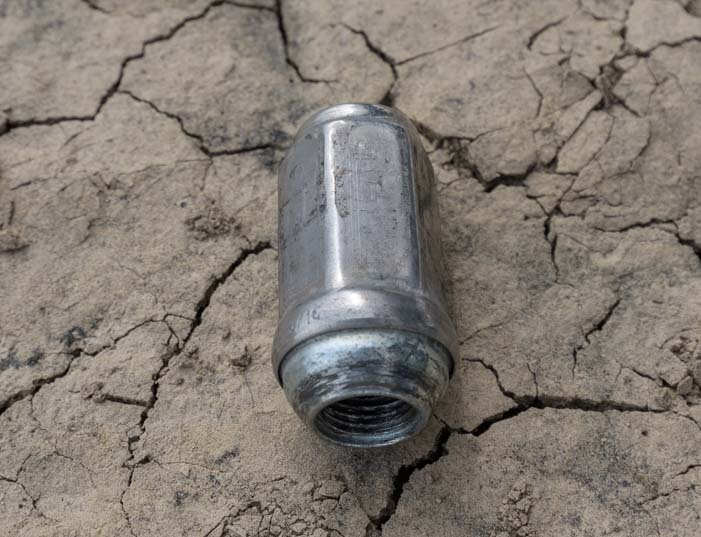 The thread pitch on the lug nut was not quite right, but the threads on the bolt had been damaged anyway as it walked itself out of the hanger. While I held the bolt in place with a wrench on one side, Mark ratcheted the lug nut on the other side. He was able to jam the nut on the bolt and re-groove the bolt’s threads enough to make a super tight connection. In no time we were back up and running and towing our fifth wheel trailer back down that crazy 3 mile road to the paved highway to go see other new and exciting destinations. As I mentioned in my post about Bisti Badlands, it’s okay for a passenger car or van, but I would leave a bigger RV in Farmington and drive the tow vehicle or toad to Bisti instead! 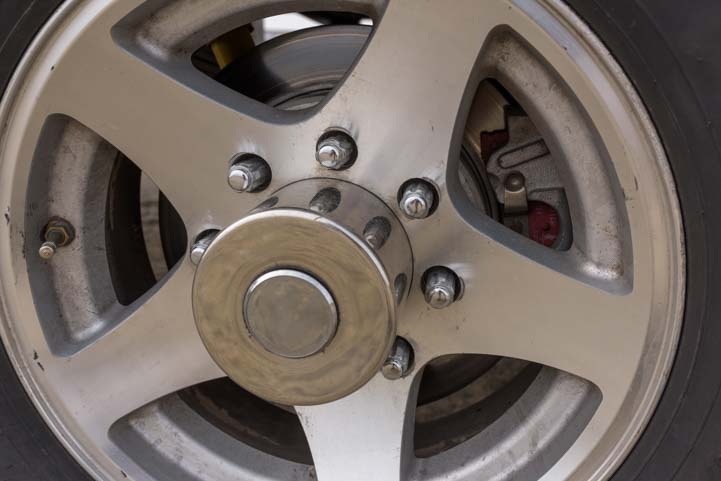 With some force, we secure the lug nut on the bolt. What a terrific temporary fix! 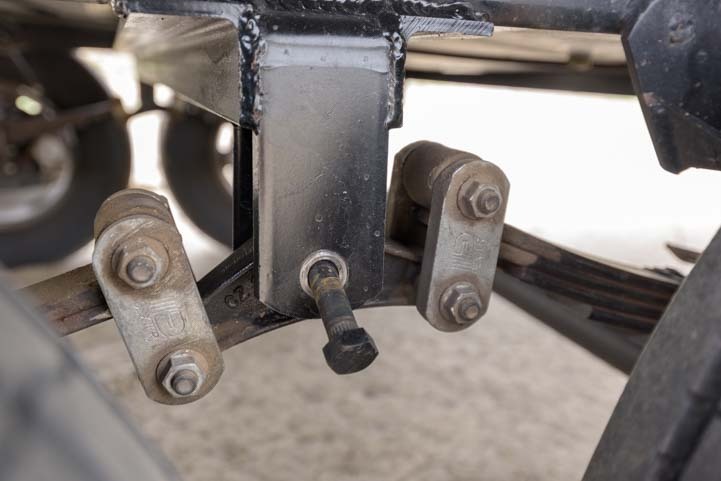 Who would’ve ever thunk that a rough road could loosen the nut on a big fifth wheel trailer’s suspension and walk the bolt that holds the equalizer in position almost all the way out?! And who would’ve ever thunk that a lug nut from the trailer’s wheels would give us such a great temporary fix to get us back on the road?! 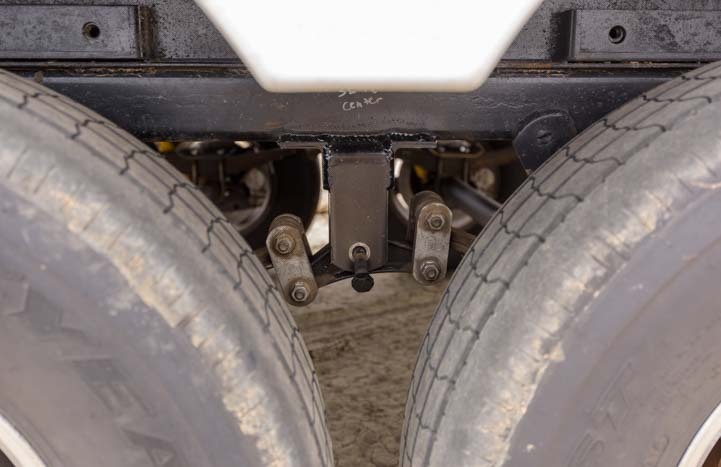 5th Wheel Trailer Suspension Failure – Replaced with our RV Warranty! 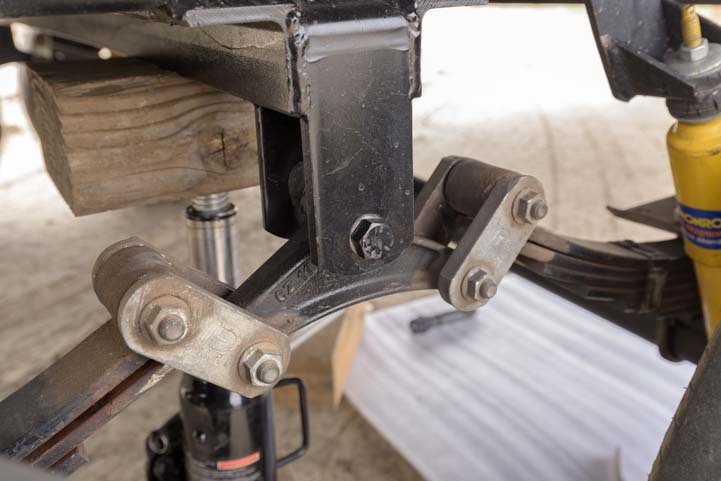 Hitch Tighteners – Anti-Rattle Hitch Clamps Stop the Creaks & Wiggles! How to Defrost an RV Refrigerator in 20 Minutes! RV Electrical System Overhaul – New Batteries, Inverter & Converter! RV Solar Panels – Flexible or Rigid? 12 or 24 volt? Mono or Poly? Yikes! Wet Cell vs. AGM Batteries & Wiring Tips for Installation on an RV or Boat! What’s A Girl To Do at the RV Dump Station? 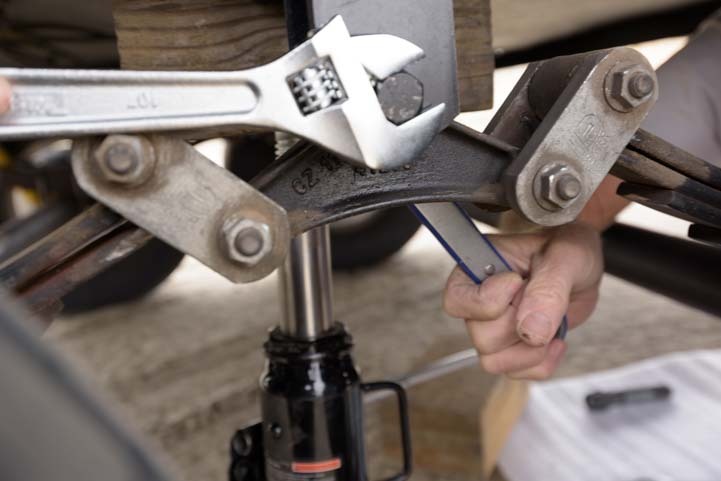 This entry was posted in RV & Boat Projects & Upgrades and tagged New, Non-Travel, RV Tech Tips, RV Tech Tips Trailer, RV Technical Topics, Trailer Suspension, Trailer Tech by Roads Less Traveled. Bookmark the permalink. Good Job on the Fix! We had one of those bolts break off where the leaf spring connects to the frame. Luckily we found the issue and Lisa and I were able to fix it by using the RV’s leveling system and my truck jack. Excellent! Where there’s a will there’s a way, and necessity is definitely the mother of invention!! Good thing you noticed it and Mark is handy enough to keep you on the road! Very true. He keeps our buggy rolling and he kept our boat floating too!!! I’m a lucky gal. Mark’s skills impress the heck out of me, but it’s all in a day’s work for him and he does these kinds of things effortlessly all the time!!! We are firm believers in Mark’s magic can. It saved us the first time we met you two at a Welcome Center in Colorado. Our bike rack had lost a nut. I needed a 5/8″ coarse thread nut and preferred a lock nut to prevent recurrence. Lo and behold Mark’s magic can contained a single 5/8″ nut and it was remarkably a lock nut!! I thought of you two as I wrote this! That was such an amazing moment when Mark saw you needed help at that Welcome Center and then fished around in his magic can and found just what you needed. The best part was discovering we had much in common and becoming friends after that! Great story…you’d better hold on to Mark! I was a little curious about the “basement” in your travel trailer! And he has a Man cave too! Hark’s a keeper, that’s for sure. The basement is the Man Cave, but it’s little more than a crawl space. However, it’s big enough for all his tools and spare parts, and one time when I peeked in there was a sign “No Girls Allowed!” (just kidding). Great to see it pays to do a walk about before hitting the road. It would be a great place for a crown nut, found one being used on our MH seats, hidden at the top of the center bolt. It always pays to check things out. There have been so many times when Mark found something amiss that would have been a disaster if he hadn’t caught it before we started driving or sailing. Great tip about the crown nut! Well timed post, again, Em, as we are getting really to depart the Arizona heat, and head to the Northwest for a few months. Another critical bolt to add to my Magic Can – like Mark’s. And thank you David, for the tip on the crown nut. There are critical parts to our Conestoga, and then there are CRITICAL parts! Good reminder about the walk-a-round, and the 12 ton jack. Have two of them, after our front 5ver (34 foot Montana)jacks gave out, on a primitive road near Pine, Arizona. You know, the weak Lippert Jacks that Mark had to replace, out in the boondocks? Had to raise the whole front of the 5ver to hitch up – with one ten-ton jack. Fortunately, the jack was high quality. But one jack was a dicey deal, especially backing up into the 5ver, on a rocky road. So you are not the only crazy folks out there who take the “roads less traveled”, or maybe “the roads not to be taken, with a big, long 5ver”. But that’s part of the adventure, isn’t it? Looks like we’ll add New Mexico to our “must see” list, along with all the other Western states that you folks have visited, wrote about, and photographed. So thanks again for sharing your adventures, tips, and tales……. Hi Glen & Bette! It’s impossible to carry spares for everything, so a magic box of options is always a great idea. Mark finds goodies in our travels for his magic can all the time, and more often than not they eventually get us out of some kind of jam. What a crazy story about the landing jacks failing and using the 10 ton jack to get hitched up again. I’m glad you were able to back into the trailer without knocking that jack loose! Our travels through New Mexico were really rewarding, and we were happily surprised at every turn by finding great National Monuments and this National Preserve to explore. Definitely put it on your list for your future adventures! In the meantime, enjoy the cool air in the Northwest. Get rid of black streaks with Mr Clean Pads (left) and make your fiver cap shine with 3M Cleaner Wax (right)! Find more tips here: RV Tips & Tricks.